The output level (how loud you hear others talk) of the TeamSpeak client can be set with the Output Volume slider. Sliding it to the right will make all sounds louder, to the left less loud. In Teamspeak 2 there are 2 ways to communicate with your friends. The first choice is called push to talk. This means that you have to press and hold a specified button if you want to talk to others. The other way is by voice activation. This means that Teamspeak will automatically transmit to your friends when the program “hears” you talk. 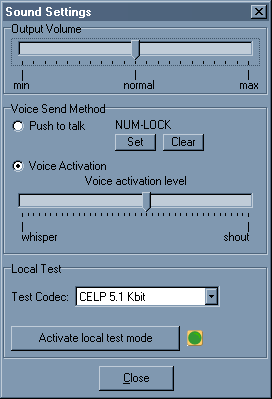 You can choose between the 2 voice send methods. If you choose push to talk, select it and press the Set button to bind a key.The key you have chosen will now appear onscreen. Whenever you want to transmit you have to press this button. If you want to use a different button press clear and do it again. If you want Voice Activation select that option. Below that option is a bar with the Voice activation level which you have to configure for optimal sound. If you slide the bar to the far left Teamspeak will transmit as soon as you make the slightest sound, even if you whisper, chances are you will be transmitting to your friends all the time while you don’t even know it. If you slide the bar to the far right you have to shout before Teamspeak will actually transmit. You can do a local test to check your settings and codecs. Choose a codec from the menu and press Activate local test mode. When transmitting the green light next to it will light up. The client will echo your spoken text. This function is a good way to check your Voice Activation setting. You can finetune the setting in local loopback mode. If you find that the Voice activation level is too sensitive in Windows (the difference between sending all the time and not sending at all is just one stripe on the bar) set your Mic input level higher in your Windows mixer. When you are done click the Close button to close the window.